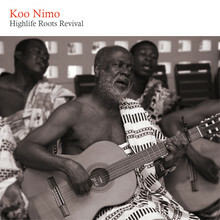 Koo Nimo is one of the last true veterans of highlife roots and palm-wine music, which dominated Ghana’s popular music scene throughout much of the twentieth century. Recorded in his backyard at home in Accra, expect acoustic guitars and rolling percussion all topped off with his gentle story-teller singing style. Whilst listening to Highlife Roots Revival, you might be surprised to hear the faint crowing of a rooster or the distant murmur of a child’s voice bubbling underneath the guitars. But rest assured: it is no accident that these sounds were left in the mix; they were captured during a series of recording sessions, which took place in Koo Nimo’s courtyard at home in Ghana. Adding a wonderful sense of intimacy to the album, these interjections underline the ethos of palm-wine music perfectly. This is, after all, a musical style named after the strong alcoholic drink imbibed at outdoor acoustic sessions, where musicians swapped their songs beneath the starlit sky and where palm-wine music was born. Join Koo Nimo in the spirit of palm-wine; kick back, tap your foot and listen to the stories unfold. Palm-wine music has its roots in the burgeoning krio culture of late nineteenth-century West Africa. Portuguese sailors winding along the coasts of Sierra Leone, Liberia and Ghana introduced the guitar to the region, an instrument itself circuitously related to the various harps and lutes of West Africa. Sea shanties mixed together local styles like gumbé and foreign influences such as Trinidadian calypso. During the early twentienth century, palm-wine gatherings were commonplace, often taking place under the shade of a large tree, with performers happy to play on as long as they were still being bought drinks.